As CEA chief economist and senior director of research Shawn DuBravac said in his opening keynote before the start of the 2014 International CES, the show is defined by two types of technology: that which is “technically feasible” though not yet targeted at mainstream consumption, and that which is commercially viable. There have been plenty of brands splitting their stands down those lines, showcasing products that are intended for broad release to the mass market as well as prototypes that are really just showcasing a brand’s dreams for the future. In the latter category, Samsung is using CES to show off three impressive panels at the opening of its stand, none of which are intended for release in Australia in the near future, but all of which show off — as Samsung Electronics Australia director of AV Brad Wright called it — a “proof of concept”. 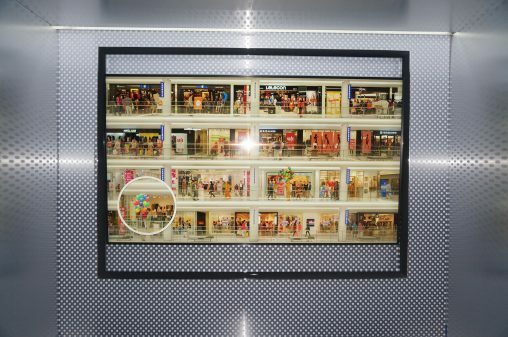 While all the talk at CES has been about Ultra HD ‘4K’ TV, Samsung took it one step further with a staggering 98” QUHD 8K panel. Viewing a 4K panel for the first time is certainly impressive, but 8K has to be seen to be believed — the clarity and detail that was visible on the TV was phenomenal. Alas, the entertainment industry still has a way to go to getting 4K into the mainstream, so this one looks a while off. One-hundred-and-five (105) inches is certainly an impressive diagonal measurement for any screen, but this panel was all the more eye-catching because of its unique aspect ratio. Rather than a typical 16:9 shape, this ultra-widescreen has a 21:9 aspect ratio, helping to create a viewing experience that is almost as good as a cinema. Just like today, rich people of the future will no doubt have stupendous amounts of money to spend on showpiece technology that they can boast about to their friends at the yacht club. This is one such TV. 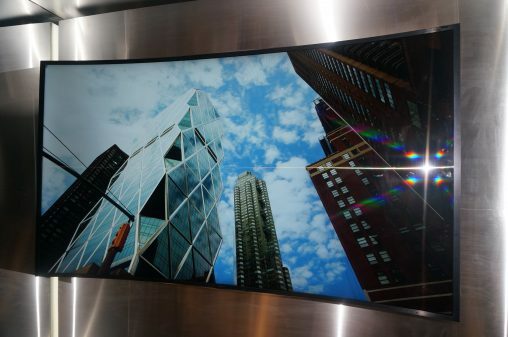 Already top of the line thanks to its 85-inch Ultra HD display, the panel is also capable of bending at the touch of a button. 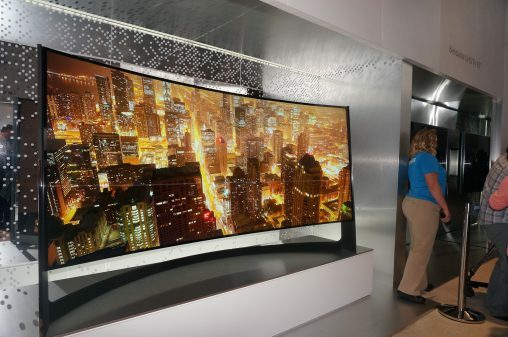 One moment you can be having a flat panel experience, the next, you can try curved TV on for size.